Creating a safe environment for our LGBTQ youth to thrive is part of the ever-critical work of our movement. The Youth Pride Marching Band is a volunteer program designed to foster character development and leadership in LGBTQ-identified youth who wish to participate in the parade by sharing their musical talents in a culturally supportive community. Registration is now open for the 2019 Pride Parade! Join the youth marching band, meet new friends, and be part of San Diego’s largest civic event. Participants get a free t-shirt, complimentary admission to the Pride festival, and much more! The youth marching band also performs at the Spirit of Stonewall Rally. 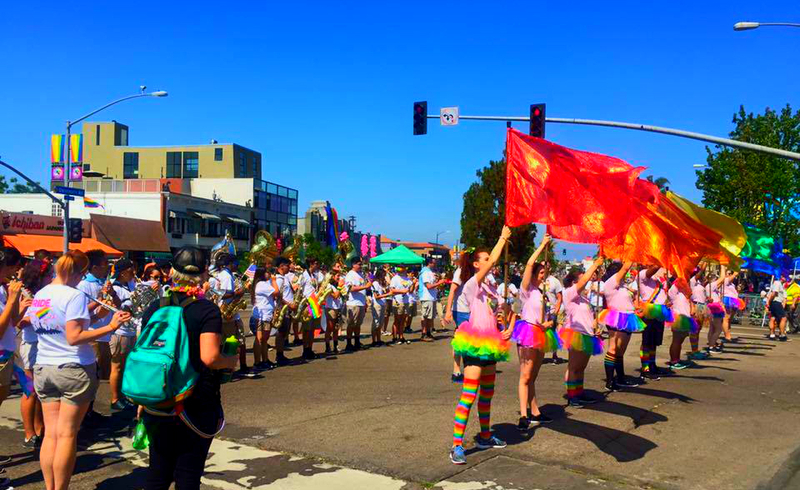 A large, spirited, volunteer musical entertainment ensemble of San Diego County youth to march in the San Diego LGBT Pride Parade. This band and colorguard will perform upbeat music in a way that represents quality and fun! Anyone currently enrolled in a school/college band class AND who has completed at least the ninth grade. Any sexual orientation or gender identity — we love our LGBTQ supporters! The satisfaction of supporting and entertaining our San Diego LGBTQ Community! You get a free SD Pride Youth Marching Band T-Shirt! You get a Free Pass for both days to the SD Pride Music Festival in Balboa Park (transportation not provided). Meet new friends from throughout San Diego County. Register now for more information, and stay tuned for updates in the future! You provide for yourself and wear: khaki shorts and black sneakers or marching shoes. Hair, hats and/or make-up: be creative! Participants will need to provide their own instruments—be sure to coordinate with your music teacher before the school semester ends. A limited amount of percussion and sousaphones will be available—please contact the band instrument manager to coordinate this. Flags and poles will be provided. Same uniform as the band. Are you a parent who is interested in chaperoning this group on parade day? Use the participant registration link to indicate your interest. Complete the information that is requested on the form, and under the drop down menu for instrument, choose “Parent Chaperone” listed at the end. A background check is required for parent chaperones—we will contact you regarding how to complete this process. Questions? Contact Youth Marching Band Coordinator Russ Sperling at [email protected].